How cute is this? 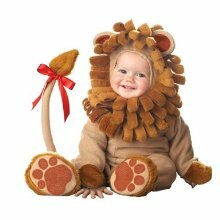 This Lil Characters Unisex-baby Infant Lion Costume is available from just $34.53 (with $11.45 Shipping). It’s never too early to start thinking about the perfect Halloween costume for your baby! Available in sizes from 6 months to 2 years. Prices vary but the 18 months to 2 years is the best price.